This 100% natural, luxuriously rich body butter is made with unrefined cocoa, shea and mango butters to soothe and nourish dry skin. Crafted in small batches with only raw oils, pure butters and brightening anti-oxidants, this body moisturizer will quench your skin with nutrients. Apply generously to skin and massage in until absorbed. Perfect to use right after bath time to seal in moisture. 8 oz / 237 g – or Travelsize 0.5 oz / 15 gr. UNREFINED COCOA BUTTER: Not only is cocoa butter high in antioxidants, which fight free radicals, it is also very high in fatty acids, helping to deeply hydrate skin. Cocoa butter is an occlusive emollient, acting as a barrier preventing moisture loss. Cocoa butter is also known to help stretch marks. We use only unrefined butter, meaning it’s not chemically de-colorized or de-odorized. 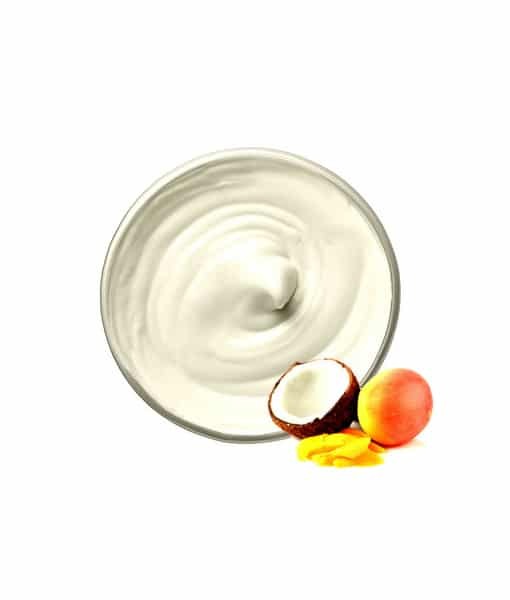 UNREFINED MANGO BUTTER: Not only does mango butter moisturize and keep skin from losing moisture, it also contains high levels of antioxidants and beneficial vitamins A, C, and E, and is known to help with UV damage. This butter is highly emollient, softening and soothing to the skin and hair. We use only unrefined butter, meaning it’s not chemically de-colorized or de-odorized. (*= Certified Organic) *Aloe Barbadensis (Aloe Vera) Leaf Juice, Cocos nucifera (Coconut) Oil, *Unrefined Theobroma Cacao (Cocoa) Seed Butter, *Unrefined Mangifera indica (Mango) Seed Butter, *Unrefined Butyrospermum parkii (Shea) Shea Butter, *Prunus avium (Cherry) Kernel Oil, *Persea gratissima (Avocado) Oil , *Olea europaea (Olive) Fruit Oil, Cetearyl Olivate and Sorbitan Olivate (Natural Olive Oil Emulsifier), Tocopherol (Pure Vitamin E), *Kosher Certified Flavor Oil blend (Naturally derived from plant/fruit material) and Natural Antioxidant Preservative (Antioxidant fruits, berries, and tea tree).